This was a three-day wildflower safari to the middle of Washington. February and March were ridiculously warm, so all the flowers were several weeks earlier than normal. Day 1: Shrub-steppe & and rimrock at Ancient Lakes, then sunset on wildflowers and cactus at Beezley Hills. Day 2: Chelan Butte & Lake Chelan, Sauer's Mountain, Sam Hill Preserve, Olalla Canyon, Peshastin Pinnacles. Day 3: Wenatchee Foothills, Mountain Home Ridge, Yakima Canyon. 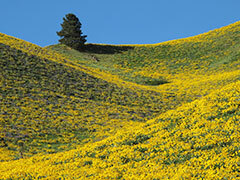 Oregon-grape lupines & mountains Enchantments, Icicle Ridge, & balsamroot showy phlox tall western groundsel?